The congregation gathered to hear the Word preached. 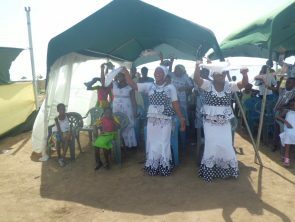 The Higher Glory House Ministry took the bold initiative of holding a church service under canopies at the church building site on Sunday 25th February 2018. 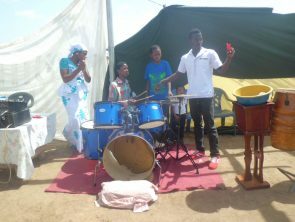 The idea of having a service at the church was rolled out to announce the church’s presence in the community. The pastor and his deacons were of the view that such a move would ensure that the community becomes aware and also prepare their minds for the eventual relocation of the church to the community. Hopefully that would soften the ground to some extent before serious evangelism is launched in the community. Surely the Lord has people for the ministry there and beyond. The congregation praising and worshiping the Lord. A lot of preparations were made to ensure that the first service took place successfully. An advance team set off very early in the morning with a truck load of tent canopies, musical instruments, public address system, portable generator for electricity, plastic chairs etc. 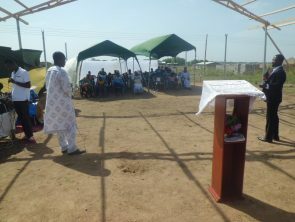 By 8:00 am church members also converged at the Ashaiman New Town local lorry station where two Toyota Hiace Minibuses were hired to convey them to the site. Set up was completed by the advance party by 9:00 am and before the arrival of the rest of the congregation. There was so much joy and excitement on the faces of the congregants as expectation of a very successful service was anticipated. The Lord was merciful to us as we had favorable weather as far as rainfall was concerned. The band praising the Lord. When church service got underway and noon approached, the temperature soared and it became very hot under the canopies. The fresh breeze that blew in the morning no longer persisted but the congregants endured until the end. As the service progressed some residents living around the area came out of their homes and observed from a distance. Since we were using a public address system they could hear the music and exhortations. 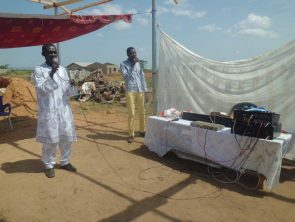 The Word of God being preached in Africa. 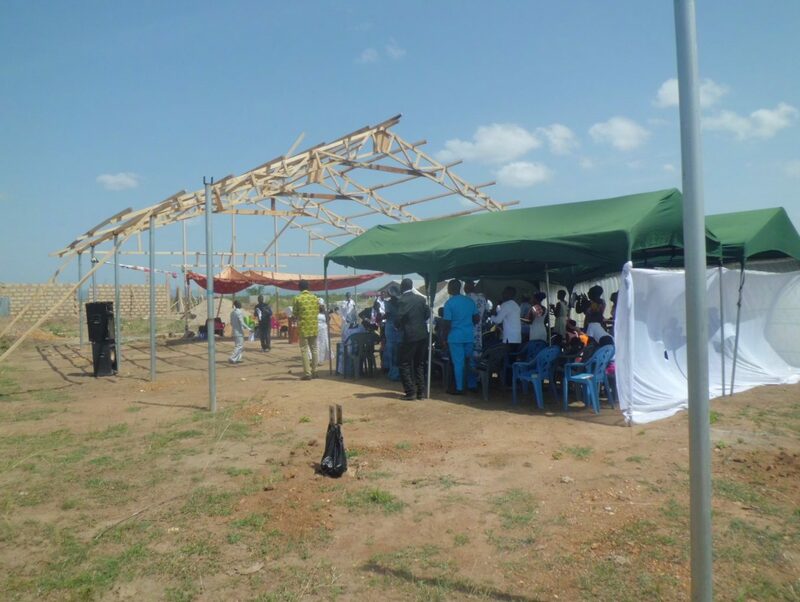 when he visited the building site and expressed the wish to worship with the church but seemed disappointed when he could not promise that services at the site would be continually held every Sunday util such a time that the structure is at least roofed and ready. In the coming days the church would prayerfully decide what to do in order to keep a presence at the site on Sundays whilst still holding services at their current location. May the Lord provide what it takes to at least roof the church building structure in the shortest possible time so that regular services can be held there. Your prayers and support in this direction would be appreciated.